Fig. 1. Transmission electron microscopy (TEM) image of vesicles from human urine. Cells release vesicles, such as exosomes and microvesicles, which are spherical particles enclosed by a phospholipid bilayer. 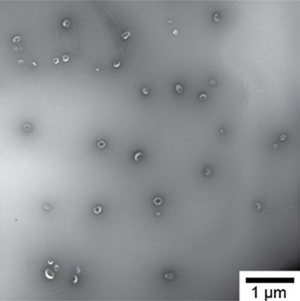 The diameter of these cell-derived extracellular vesicles typically ranges from 30 nm to 1 µm , the smallest being some 100-fold smaller than the smallest cells in the human body. Fig. 1 shows a transmission electron microscopy image of vesicles from human urine. Because cells release vesicles into their environment, body fluids, such as blood, saliva, and urine, contain numerous cell-derived vesicles. Cells employ vesicles to remove waste and transport and deliver cargo, such as receptors and genetic information, to other cells. Since the cargo allows vesicles to target messages to specific cells, vesicles most likely play a key role in intercellular communication. In addition, the size, concentration, cellular origin, and composition of vesicles in body fluids is changed during diseases. For example, increased levels of vesicles in plasma are associated with thrombosis and metastatic carcinomas. The functions of vesicles and their change of properties during disease imply that vesicles have many clinical applications. For example, an abundant concentration of a particular vesicle type could be indicative for the presence of a disease. Such information would enable early recognition of a disease and monitoring the efficacy of therapy. Furthermore, vesicles can be used to deliver drugs specifically to the diseased organ without being cleared by the immune system. For these applications to become reality, we need an instrument capable of determining the size and concentration of a specific vesicle type. Fig. 2. Schematic of the Tunable Resistive Pulse Sensing (TRPS) - Raman microspectroscopy hybrid. To determine the size and concentration of a specific vesicle type, Tunable Resistive Pulse Sensing (TRPS) is combined with Raman microspectroscopy. Fig. 2 shows a schematic of the hybrid TRPS Raman microspectroscopy setup. TRPS consists of two fluid cells divided by a non-conductive membrane. An electrical current flows through a single pore in the membrane with a diameter typically <1 µm. The relative change in current is approximately proportional to the volume of the vesicle and is calibrated with beads of known diameter. By applying a pressure difference between the fluid cells, pressure-driven flow dominates the flow caused by electro-osmosis, electrophoresis, and diffusion. The count rate is related to the concentration of vesicles using beads of known concentration. Thus, TRPS is capable of determining the size distribution and concentration of vesicles in suspension . After the vesicle has passed through the pore, it is optically trapped by a focused laser beam operating at a wavelength of 785 nm. 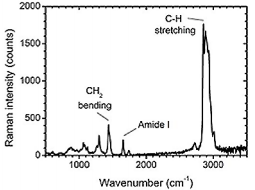 The Stokes shift from light scattered by vesicles is measured using a spectrograph (HoloSpec F/1.8i, Kaiser Optical System Inc., USA) and a CCD detector (Newton DU920P-BR-DD, Andor Technology, UK) to obtain a Raman spectrum, which is molecule-specific. Consequently, the Raman spectrum is likely to contain information on the cellular origin of a vesicle. An advantage of Raman spectroscopy is that it is quantitative and label-free. For comparison, most laboratories use fluorescent anti-body labeling to identify vesicles, which is laborious and involves practical problems. For example, antibodies usually bind not only to the antigen of interest but also to Fc receptors. Fig. 3. Size distribution and concentration of urinary vesicles. We have modified the upper fluid cell of the TRPS system (Izon Science Ltd, Christchurch, New Zealand) to enable optical extension of the pore. After the modification, we have evaluated the applicability of TRPS to determine the size distribution and concentration of vesicles from human urine. We selected urinary vesicles, because urine contains a relatively high concentration of vesicles with low contamination of lipoproteins and protein aggregates. Fig. 3 shows the size distribution of urinary vesicles as measured with TRPS. The concentration of vesicles decreases with increasing diameter and the smallest vesicle that we could detect was approximately 100 nm in diameter. Fig. 4. Raman spectrum of a single platelet-derived vesicle. The peaks reveal specific chemical bonds, which are present in this vesicle. The extension of TRPS with a microscope objective enable us to locate the pore and focus the laser beam onto the pore to optically trap single vesicles. Fig. 4 shows the Raman spectrum of a trapped plateletderived from a platelet concentrate. The peaks in the spectrum are specific to the chemical bonds and symmetry of the molecules. Body fluids contain cell-derived extracellular vesicles, which contain clinical information. To study the role of vesicles under physiological and pathological condition and to employ vesicles as biomarkers for disease, the size, concentration and cellular origin is preferably measured of single vesicles. Therefore, we are developing a hybrid TRPS - Raman microspectroscopy setup. 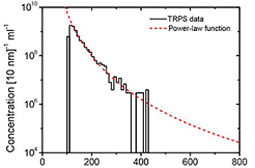 We have shown that TRPS is suitable for sizing vesicles down to 100 nm. In addition, we have measured the first Raman spectrum of a single platelet-derived vesicles. Next, we intend to apply the setup to differentiate between vesicles that originate from different cell types.